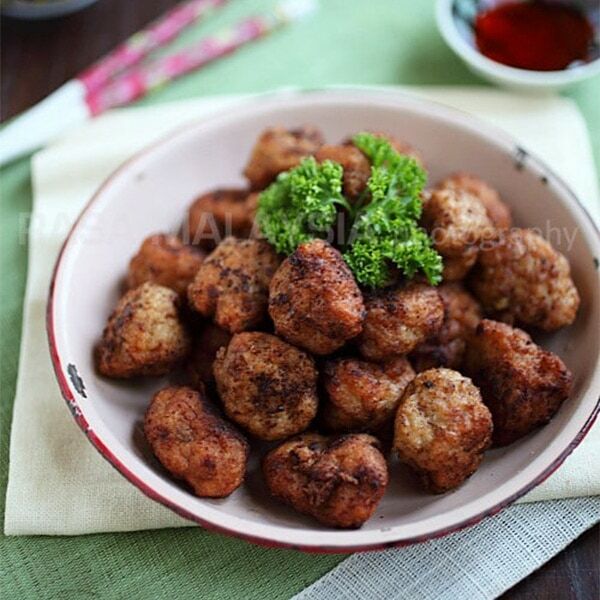 This is a Chinese meatball recipe with ground pork and spiced with five-spice powder. Fried meatballs is a homey recipe, one that you can prepare every day for your family without much hassle: a recipe that is great for children and adults alike. The only special ingredient in this fried meatball recipe is the fish paste, which makes the fried meatball extra yummy. I use frozen fish paste. If you can’t find it, you can also substitute it with minced shrimp. Enjoy! Everyone loves meatballs. This is a Chinese meatballs recipe where the meatballs are fried. Easy and delicious meatballs recipe that everyone will love. Mix all the ingredients (except the oil) in a bowl and blend well. The mixture should be sticky. Heat up a wok with some oil enough to cover half of the meatballs (shallow fry the meatballs). Wet your hands with some water. Using a teaspoon, scoop up some of the meatball mixture and shape it into a small. Drop the meatball into the wok to fry. Repeat the same until you use up the mixture. Use the spatula to turn the meatballs to fry the other side until they are cooked. Serve hot. looks very delicious and yummy,i like this recipe, thanks for sharing.It is done and enjoy it…..
Ooh, this looks delicious! While it’s likely to get eaten right away when made up, do you happen to know if this recipe freezes well? 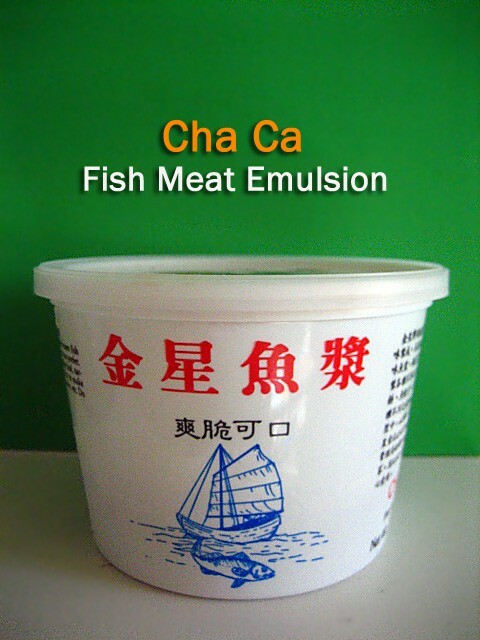 What would you think of substituting the fish paste with shrimp paste? Oh this looks yummy and easy, I will have to add this to my “to make” list. Definitely and after you try this fried meatballs recipe, I am sure you want more! I can take this meatball one after another without noticing how much calories intake. I come from an Italian family where meatballs are serious comfort food – love this version with five spice powder and fish sauce! Just brilliant. Hi Katherine – you should try it. It’s very good! My mom would also add grated taro. I suppose every family would have their own version but the end result would be delicious nonetheless as they are made with love at home. Grated taro, that’s a great idea. Yes, love meatballs. I am not sure why though, but I think it’s because the meat balls lost its moisture during the deep-frying process. Did you fry for too long? Did you say fish sauce? YUM! I love anything with fish sauce~~! I’ve heard about five-spice. I need to look into that when I go to Asian market next. I’ve seen many recipes with that spice but I’m not familiar with it. Thanks for the wonderful recipe Bee! Will try it today. Thanks for the recipe. My paternal grandma used to make delicious fried meatballs every CNY. Now she’s so much older and has had a relapse of cancer, we no longer get to enjoy such treats. I’ll try this recipe and make some for her to try. :-) Hope she will like it cos it sounds really good. Why I cant see your meat ball recipe? Please click page 2 for the fried meatball recipe (at the bottom). Can I add fresh fish paste instead of the frozen one, what other ingredient should I put into the fresh fish paste? Thanks. Yes, you can. You just add the fish paste into the pork. I love this! Just made this for dinner and my son loves it! Thank you so much for sharing all your wonderful recipes. Reminds me of my childhood with my granparents! I would like to make these for dinner but I am struggling with what sides to have with the meatballs. Any ideas? I think it goes well with salad or even soups, or noodles. Tried this last night and it was good! :) But I added carrot purée and chopped coriander as there’s no onion at home. How would I know if the meatballs are well cooked yet not overly cooked inside? Cheers! I just love this! Terrific pictures. It is hard to get the fish paste in some cities, so I often add in some corn flour or tapioca flour or even bread cubes. Meat balls is one of the best and simple dish. From here we can make it into Sweet and Sour and so on. I often add in some tapioca flour and all the ingredients given and BEAT until a ball is formed then make into balls. Or you can add in some fried salted fish — chop into tiny cubes into the minced meat. Fish paste is just basically fish meat. It’s what made fish balls. Not sure if you can buy ready-made fish paste from Singapore, if not you can use shrimp or fresh fish meat. Or wet market yong tao hu stall. Could anchovy paste be substituted? You can substitute with shrimp.